Unfortunately, many blogs nowadays fail even before they get going. The reason for this is not only the tremendous number of bloggers who seem to cover any topic in the world. And neither the reason for a mediocre material is the main one, although you should really be very good to attract reader’s attention. 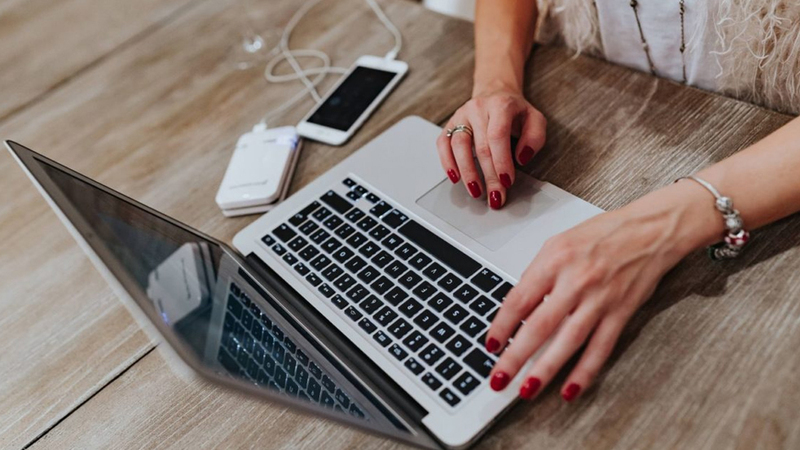 We are prone to think that probably many bloggers neglect the fact that their blogs must have a clear structure, good navigation, aesthetic appeal and in general be of superb quality. Actually, correctly chosen WordPress themes for lifestyle blogs might make a perfect form which you just need to fill with proper content. Today we are going to have a look at some advantages of WordPress themes that can be used for building a popular blog. Why Choose WordPress for blogging? When you get so excited to create content on the sphere you adore, be sure you choose the right content managing system. It will define how easy it is for you to add any content and manage the whole website. Initially, WordPress was the CMS developed for non-tech savvy bloggers and now it has become one of the most popular platforms on the web. Its intuitive dashboard allows controlling the site with ease. You don’t need to undergo special training to master this CMS. WordPress themes are famous for their customizable framework and they meet anybody’s unique demands. They have a flexible interface and you can change some of its components to your liking. Moreover, there are tons of useful plugins you can upgrade without any problems. Unlike some highly profitable corporations bloggers can’t buy an expensive website built from a scratch. However, ready-made themes based on WordPress might fully satisfy their needs. Thus, affordable price becomes very important factor to take into account. Ready-made WordPress templates offer great tools for creating a genuinely unique site, and this diversity of options and flexibility will satisfy anybody’s taste. Almost every theme goes with a handy page builder to create as many pages as you wish or theme plugins to tweak the style and design. All the themes boast professional look and great functionality. You can play around with a rich UI lit to achieve the desired results. Multiple social widgets, embedded forms, and pre-made pages will advance your blog on the web. Another important factor is mobile-friendliness of modern WP templates. Since the world has become mobile, it is crucial for a website to have responsive design that will automatically adapt all the web elements and layout to fit into the screen of any device. So let’s have a look at some blogging WordPress themes which you can operate with minimal effort and maximum pleasure. 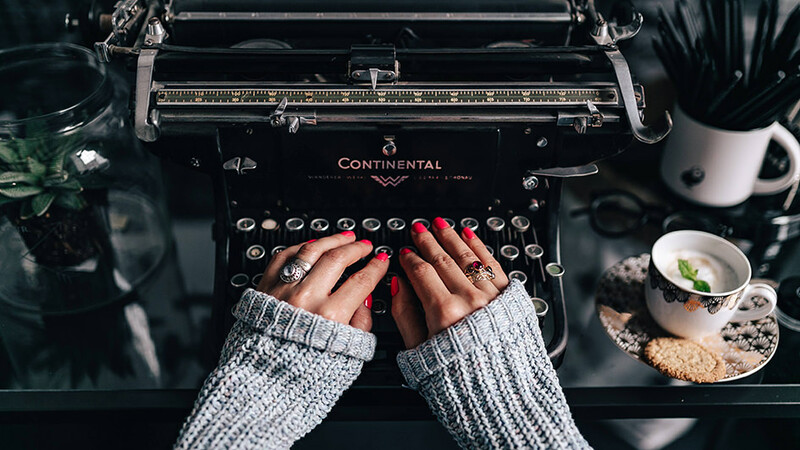 This little review might be helpful in choosing a template suitable for your type of blogging activity and will genuinely respond to your needs. 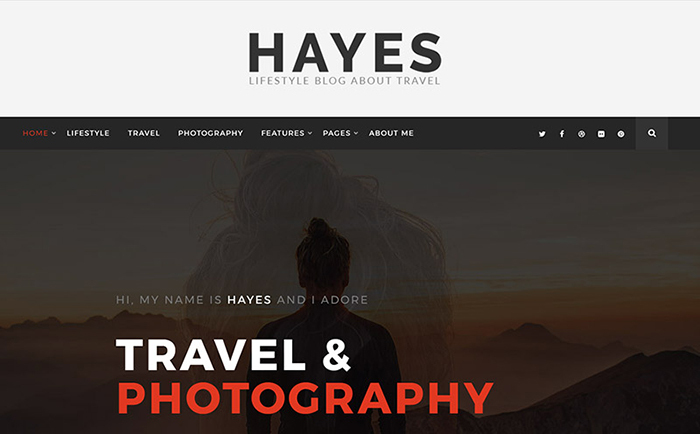 This clean and minimal theme is specially developed for thematic blogging and it stands out due to great readability, 100% responsive design and retina-ready quality. It goes with a rich variety of homepage designs and blog layouts and features 3 blog post types (for standard posts as well as image and video posts). You are free to choose between 6 gallery types, and thanks to the well-written and detailed documentation you will install and customize the theme with ease. 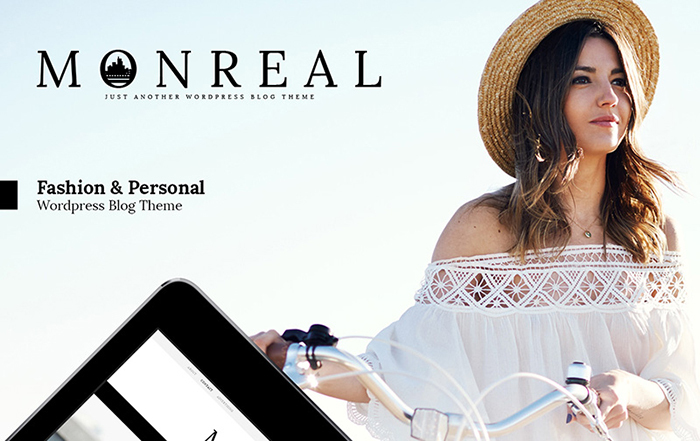 Meet another outstanding theme for a fashion blog or magazine, which boasts clean design, readable typography and 15 superb fashion images that go as a bonus. The theme is flexible and goes with smart customization options and unique easy installation. Such features as Post carousel and social media widgets will enhance your online presence. It goes with a pack of integrated Google fonts to diversify your posts and free 24/7 support. 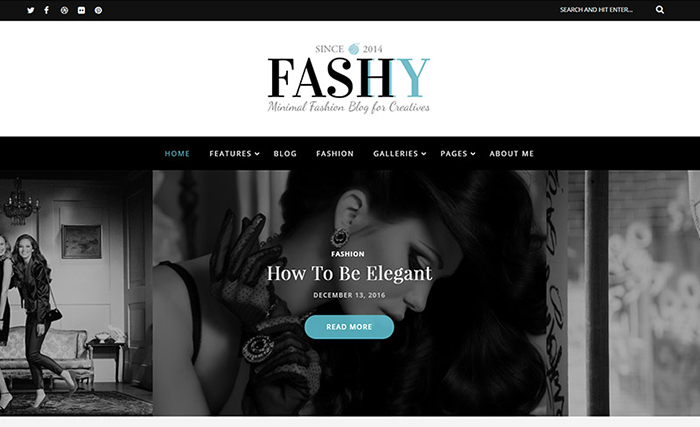 This sleek theme was specially crafted for the fashion industry and it will make an outstanding blog. Being multipurpose, the theme contains a variety of pre-made pages and web elements that allow you to make any site to fit your needs: a portfolio, a corporate website etc. The theme is written with clean code and optimized for page speed so your readers will be satisfied with the performance. Above all its minimal design with splendid animation will be appealing to the most demanding audience. 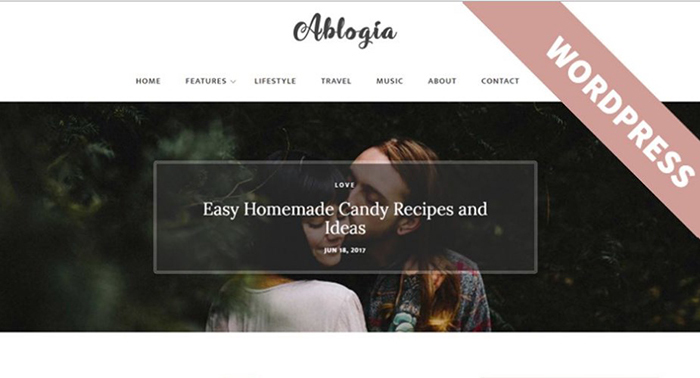 Meet another neatly organized theme for blogging which boasts great features and built-in elements. It is equipped with 600+ Google fonts, a handy contact form, and pre-designed pages like About us and 404. The theme has a valid coding, and every step is taken to make it SEO-friendly. It is fully responsive performing well on mobile devices, and compatible with most modern browsers. This theme will make your blog stand out in the crowd due to its minimal sleek design and enhanced readability. 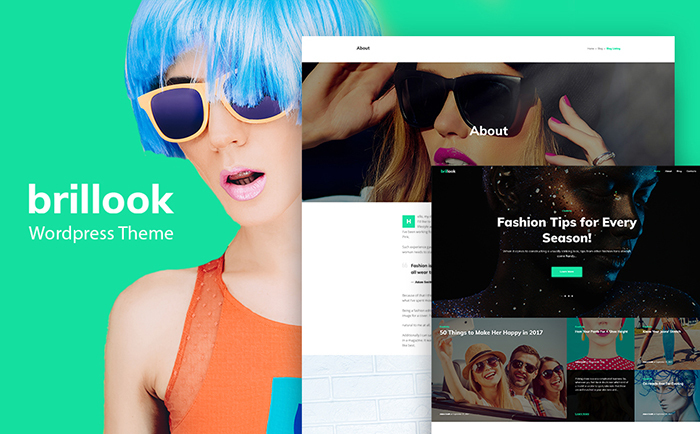 Along with a pack of modern blogging features, you get 15 fashion images to fit your content. You will enjoy seamless quick installation and trouble-free customization thanks to the Live customizer. 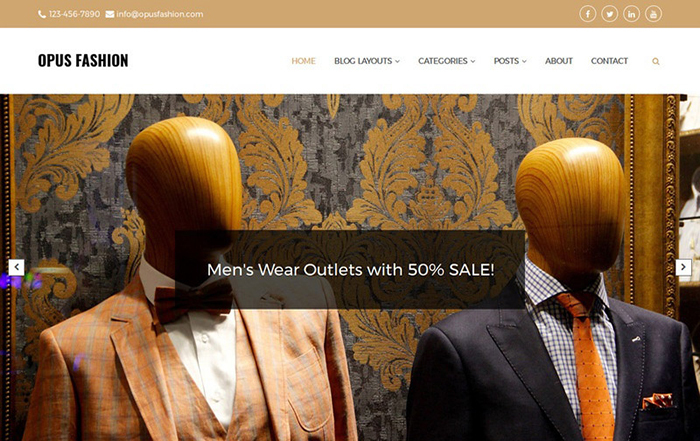 The theme is fully responsive, SEO-optimized and can easily be transformed into an online store. This particular theme shows up thanks to its emphatically masculine charm and elegant typography. It goes with Social Media and eCommerce widgets, stunning galleries, ad management tools. Theme options allow you to tweak the style to suit your taste. Above all the theme is equipped with Revolution Slider to draw your visitor’s attention with a stunning visual presentation, and 6 home page and blog layouts. This stylish and neat-looking theme is a universal solution to any demand. Being multipurpose, it can serve as a personal blog, a corporate site, a professional portfolio and many more. The theme boasts the responsive design that ensures its high-quality performance on all modern gadgets. 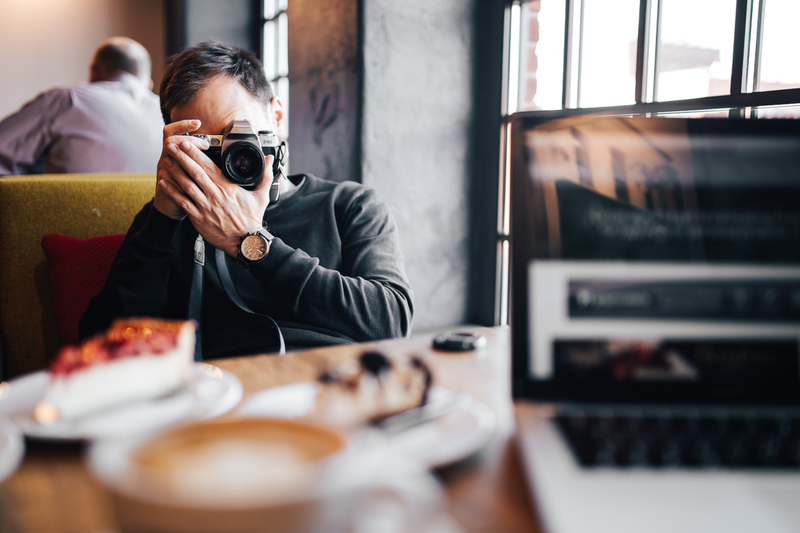 You can easily apply various color schemes, choose between 4 different layouts for your blog, change the background and add any type of content such as images, video, and audio. 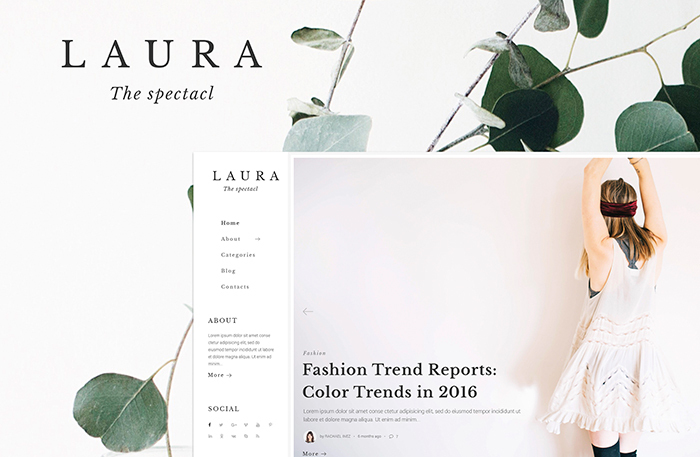 Provide your audience with most juicy information using this fashion and lifestyle blog template. Its page builder, live customizer, and graphical user interface makes the process of customization simple and enjoyable. The theme goes with a bunch of premium widgets and the code is clean and easy to modify. Implemented Google fonts help creating a unique look for your posts, and integration with social platforms will attract a new audience. The immaculate style and appeal of this hip and the edgy theme will be the strong suit of your blog. Monochrome imagery and minimalist design put a premium on your content. 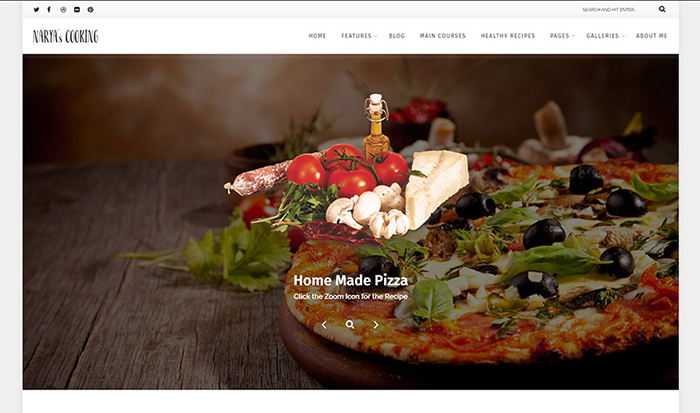 The theme is crafted using best coding practices including HTML5 and CSS3, which makes it SEO optimized and helps with search engine rankings. The theme supports several blog post types and layouts, and its revolution slider is enhanced with the stunning double exposure and film strip effects. This light-weight theme for blogging will allow your site stay on top of most search engines thanks to SEO Optimization and high performance. Nothing is in excess and the theme is extremely convenient for users being supplied with infinite scroll. It is fully responsive and the images in the tiled gallery on the homepage will look great on any screen. Instagram images in the footer will engage your visitors as well. 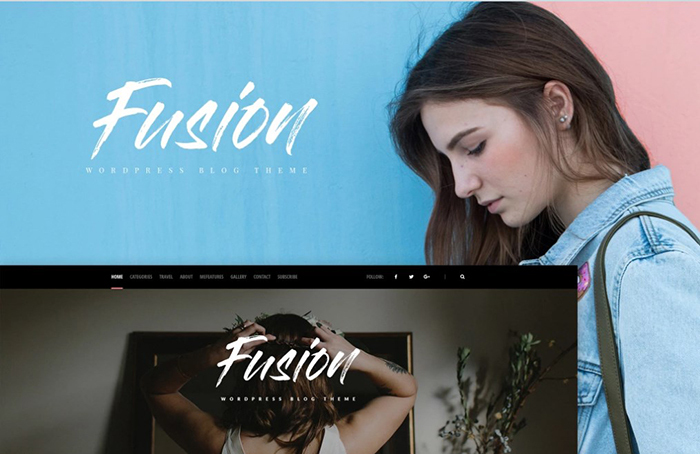 Enjoy this glamorous WP theme for fashion blogging which is enriched with multiple custom widgets to advance its functionality. 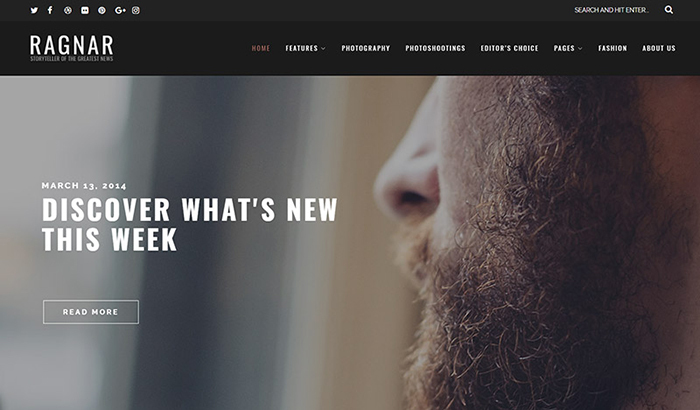 The theme has 7 header layouts, a post carousel with a slider to attract more attention to the area of focus. The live customizer allows fast and effortless adjusting the design of your site and you can adjust it without any prior knowledge. 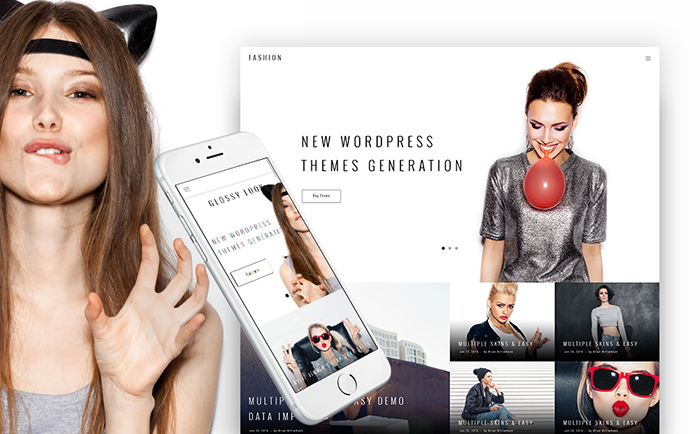 Any lifestyle and fashion blogger will be satisfied with the modern design of this WP theme with numerous customs widgets. You can promptly adjust the design of the theme without reloading. The theme is SEO-optimized and has a link to social media profiles that make a strong online presence. Moreover, its layout easily adapts to mobile devices and clean code ensures its fast performance. 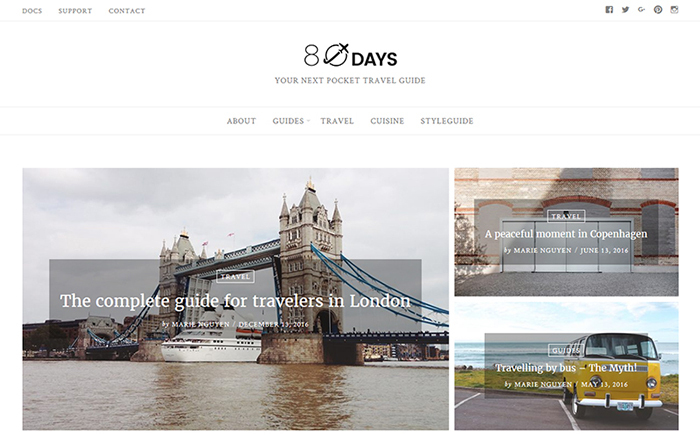 Meet a fully responsive theme carefully developed for travel blogging. Its Social media widgets, integrations of sharing buttons will help your readers share the most amazing posts and promote your blog on the web. The theme contains stunning galleries with careful attention to details and styling. Your blog will have unobtrusive elegant typography and won’t be overcrowded by flashy design elements. 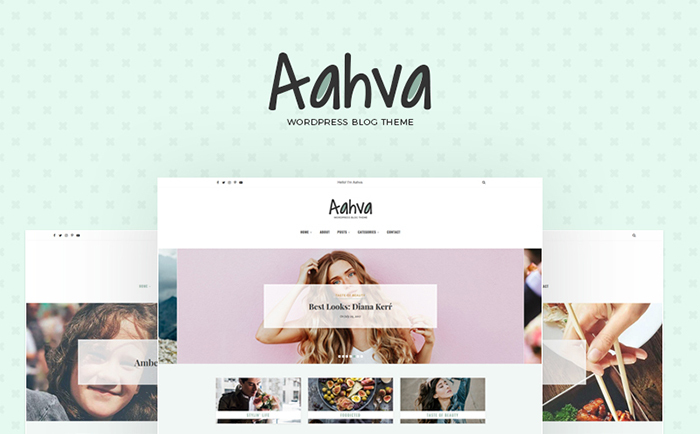 This superb theme with a unique modern design will cover any blog’s needs due to its rich functionality and unlimited styles and layout variations. It goes with a featured slider in 5 variations, allows different kinds of posts (standard, video, gallery, music posts) and has a user-friendly design thanks to sticky navigation and sticky sidebar. You will earn more ranking thanks to Social media icons in the header and custom Instagram widget plugin. 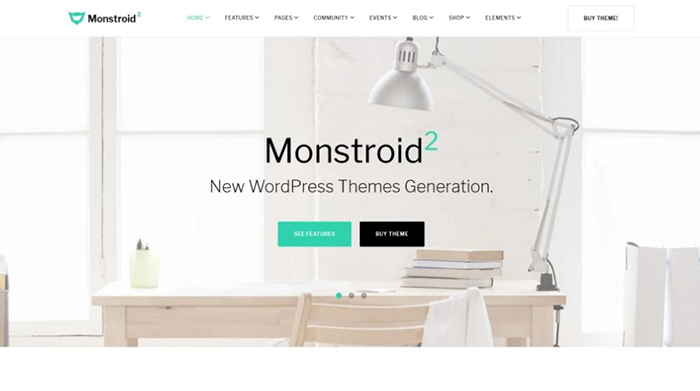 Present your content in the most beautiful way possible with the help of this stylish WP theme with tons of useful widgets and tools. It is flexible, fully customizable and 100% responsive working smoothly on any device. Ad management tools allow comprehensive and easy control over the site. It’s universal clean design and rich typography let use the theme for any sphere of interest. 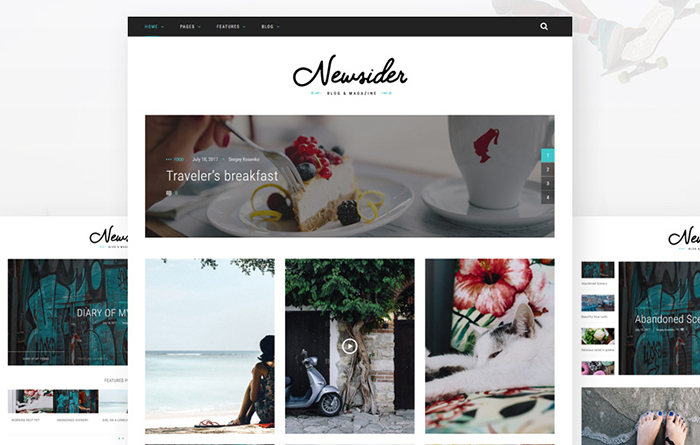 This premium responsive theme makes a great creative ground for any blogger. You are free to choose among 5 possible demo-sites before installing the theme. Moreover, the theme includes 600+ Google fonts, several headers, and beautifully featured sliders, and you can select the number of posts on the page. The theme will help you gain the popularity among any audience, as it is ready to be translated into other languages. 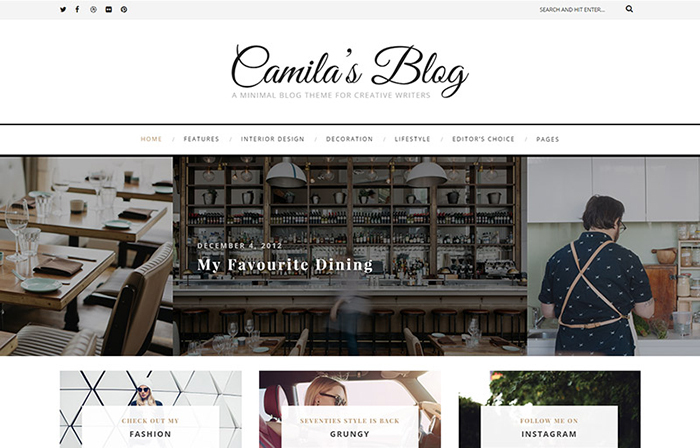 Designed with the most recent web trends in mind this blogging theme boasts an elegant design and amazing functionality to fit your culinary blog. It is equipped with intuitive Ad management tools, a wide selection of unique headers and footers, beautiful galleries and a variety of posts formats. You can easily tweak the settings using powerful tools and promote your blog using multiple Social links. 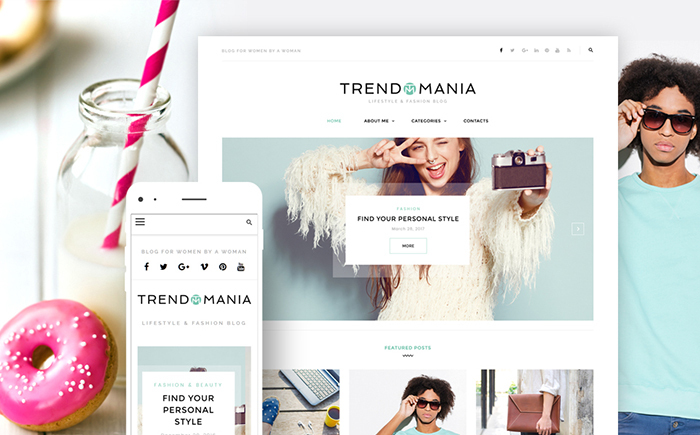 Share what you’re passionate about online with the help of this trendy responsive theme. It shows your content as a top priority and has readable fonts. You will control and manage the site without any special knowledge, and the installation will be easy thanks to a thorough documentation. It supports various posts formats and social options to reach as many readers as possible. This theme will attract readers to the object of your attention due to minimal and clean design and soft color scheme. The theme is built with readability in mind and there is nothing in excess. Clear structure, simple navigation, fast loading speed will be additional advantages of the theme. 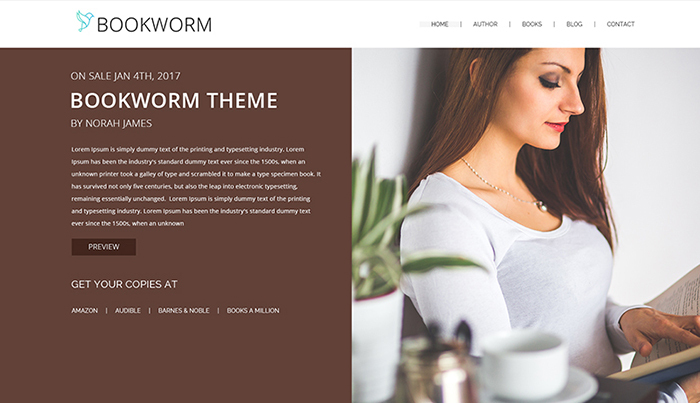 This cozy bookworm theme is search engine friendly and has a responsive design. Your fashion-oriented blog will attract more attention with this fresh and juicy design with a focus on visual presentation. 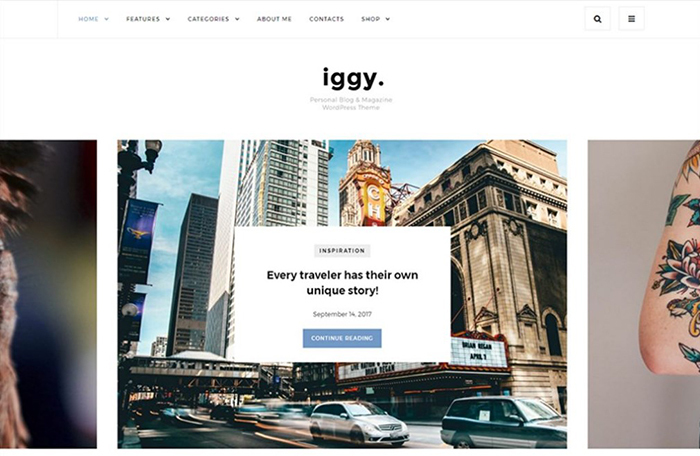 The theme contains all the necessary options for advanced blogging: a post carousel, social media widgets, user-friendly navigation and a unique style. The theme is easily customized in a real-time mode thanks to powerful page building tools and WordPress Live Customizer. It is compatible with most browsers and has a great media library. 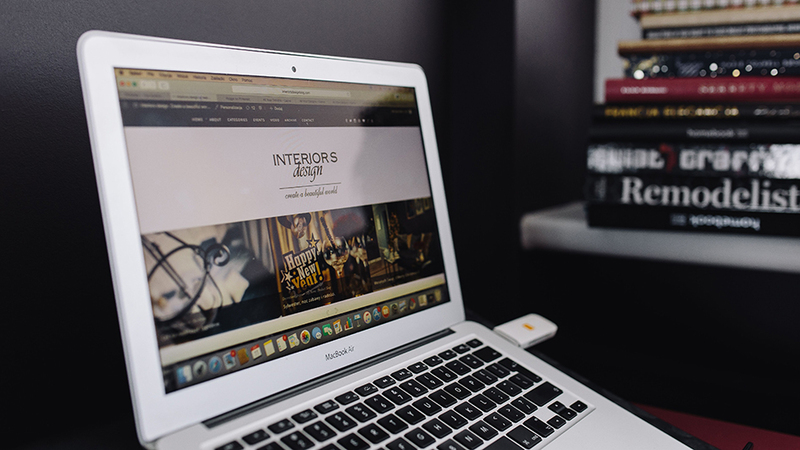 Using any of these themes to start a blog, or moving your existing blog to WordPress might lead you to become an influencer. Luckily, WP theme has everything to ensure your success: top-notch design, readability, powerful functionality, and SEO-optimization. WordPress grants you with much freedom and control, which is essential for any creative person. All you need to care about is the quality and regularity of your posts. We hope that our quick-look will be helpful in making a decision on what theme fits your area of interest best. We hope to read your impactful WP blog on a short-term horizon!